TUCSON, Ariz - Everyone is wearing headphones. But how many people are cleaning them? Consumer Reports says ten minutes and some common household supplies are all you need. 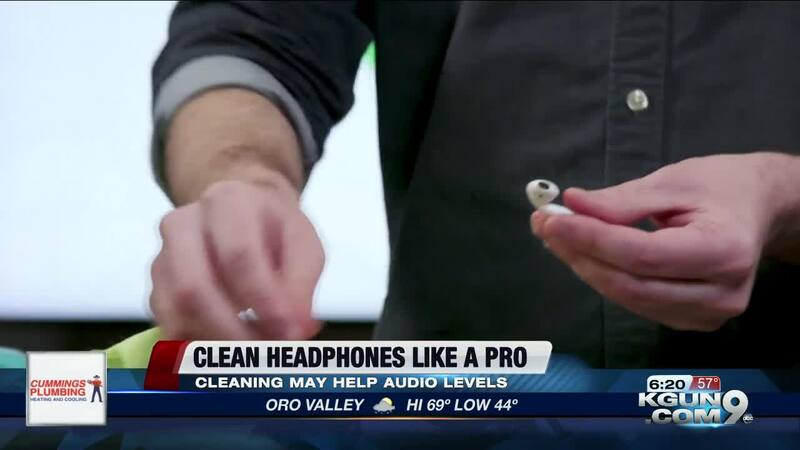 “If your headphones have removable tips, you want to take them off and clean them separately," says Consumer Reports Tech Editor, Thomas Germain. "Here’s where that toothpick comes in handy. You just want to take that kind of gently rub it through here and just pull all that gunk out. You don’t want to be sticking toothpicks inside the inner workings of your headphones, it’s pretty delicate in there and can be easy to damage. "Also, if your headphones have a mesh screen covering the drivers, that can be a hot-spot for wax and you can just use the toothbrush to clean that off," says Germain. "Going to brush it gently across, you don’t want wax getting pushed further into the screen there." “Apple recommends using a dry cotton swab to clean their mesh screens, again just be really gentle with it," says Germain. For the outside, a few drops of mild dish soap in warm water is all you need. Just be sure to wring the towel out well. Water and electronics don’t mix. As far as other cleaners go, Consumer Reports says skip the alcohol. While it’s fine to use on plastic and rubber, alcohol can dissolve foam, so stick to mild soap and water. Baby wipes could be a good alternative. Just be sure to use ones that are unscented and alcohol free.